The watch has become a staple of many people around the world. It has become a way to keep up with the demands of life and has also become a means to make a fashion statement. Some wear their watches to make sure that they catch the train on time and others wear theirs simply for its sentimental value. No matter why you or those you know wear a watch, these miniature timepieces have become a part of cultures all over the world. 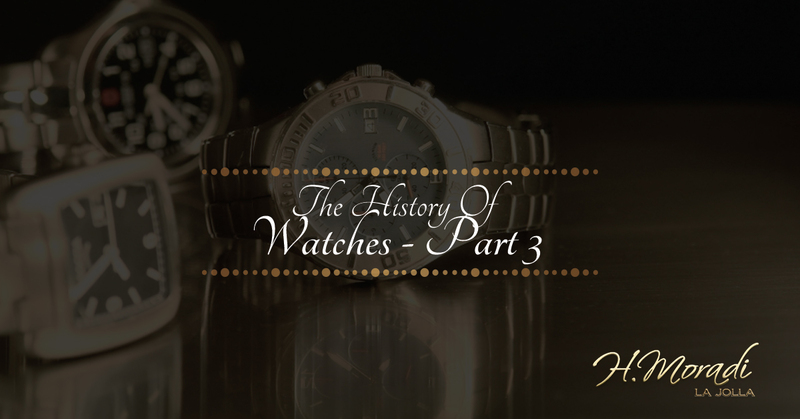 Today, on the H. Moradi blog, we will be diving further into the history of the watch starting where we left off in part 2 — we will begin by exploring how the expansion of the American railroad affected the production and standards for watch-making. Are you looking to sell your Rolex, get cash for gold, or get rid of that old engagement ring? The jewelry buyers of H. Moradi Jewelers in La Jolla would love to help. Visit our website to learn more about what we can offer you. With the coming of the American railroad, the need for accurate timing was a must. Webb C. Ball is responsible for establishing precision standards for railroad chronometers. Chronometers were very popular during this time: they used temperature-compensated balance wheels and jeweler bearings. To find the most precise watch, a contest was held at the International Centennial Exposition in Philadelphia. The top four winners of this event were given mass production. With all these opportunities for advancement, by 1900, the accuracy of watches could be described in seconds. It is said that the first wristwatch was created for Caroline Murat, the Queen of Naples by Abraham-Louis Breguet. Contrary to what many assume, wristwatches were first worn by women, and men continued to wear pocket watches until the early 1900s. Caroline Murat wasn’t the only monarch to wear a wristwatch; Elizabeth I of England wore a wristwatch made by Robert Dudley. Queen Elizabeth’s watch was referred to as a “arm watch” and most wristwatches were referred to as bracelets and marketed for female customers as such. However, the tides turned as men in the military began wearing wristwatches. The pocket watch was discovered to be entirely impractical and so many men began to strap their watches to their arms. The Watch Wristlet was marketed for men in 1893 and men in the British army — particularly officers — wore watches during the Anglo-Burma War in 1885. The wristwatch continued to become a regular piece of military men’s attire. As World War I came to a close, the mass market for wrist watches opened. Due to its use in war and the desire of the general public, the watch was seen less as a luxury item, but as an item of practicality. Military men weren’t the only one’s wearing watches. These personal timepieces were also being seen as a part of personal fashion as well. The wristwatch has continued to evolve with the development of new technology into what we have today. To sell Rolex watches to us or simply get rid of old estate jewelry, visit our jewelry buyers in La Jolla.